Heirloom Meals has just finished filming the PBS Thanksgiving Special! It was a thrilling experience, and I'm looking forward to sharing it with all of you come November. We are still looking for sponsors with short money. Your business/company will be featured in the special: a wonderful benefit for a small price. 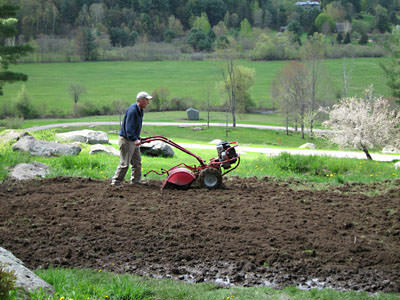 Email me if you are interested: carole@heirloommeals.com. Be sure to check out the Thanksgiving Special teaser and sampler as well! 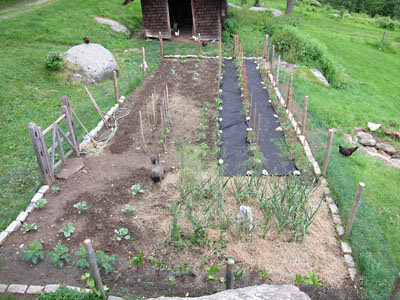 Last year my garden consisted of 12 tomato plants, 20 garlic plants, some asparagus, broccoli and onions on a patch of dirt that measured 10 x 10. Among the miracles of nature are the migration of the turtles to lay their eggs. They emerge from swampy bogs, make their way across highways, roadways and other perilous paths to find a sandy, dry place to lay their eggs. I find this fascinating. She lays her eggs and goes bck to the swamp. 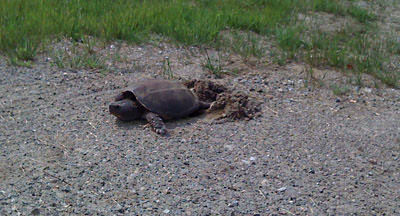 When the turtles hatch they are hard-wired to find the swamp and their mom - how cool is that? Sometimes the best dinners are with what most consider breakfast foods, in particular, eggs. And our chickens are laying like crazy right now. 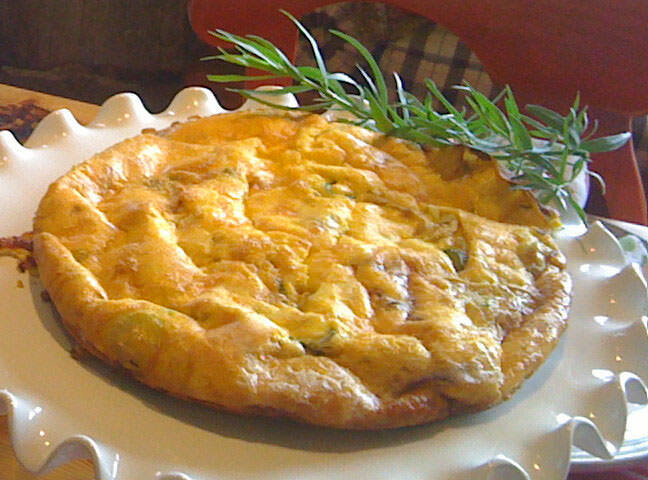 One of my favorite and simplest recipes is an onion frittata. I take a red onion, a sweet onion and scallions, slice them thinly, then saute them in olive oil until softened. Then I make a paste of 4-5 garlic cloves, minced and smooshed with 1/2 tsp sea salt and some fresh tarragon. Add the paste to the onions until aromatic and pour in the 6-8 well-beaten eggs. Continue to simmer until well-set and then place in 400 degree oven for 10-15 minutes and golden brown on top. Remove from pan, slice and serve with a salad and some yummy sour dough bread. Guess what's for dinner? 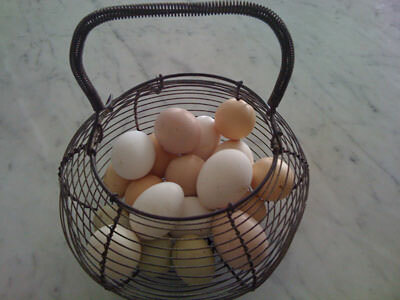 And if you want gorgeous orange yolks like my chicken eggs, try to find Pete and Gerry's Heirloom Eggs!! 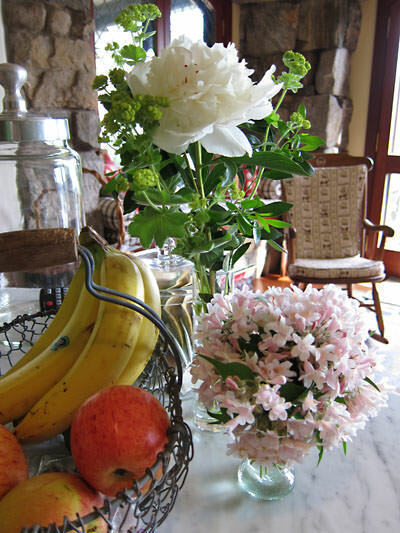 What's better than going out into your garden and snipping some flower? Right now it's all about the beauty bush and peonies. You were on my mind, in my thoughts and prayers and you did great!! If I had written this earlier in the day, my musings would have centered on hope. Now, I know you made it through brain surgery, tumor removed, surgeon happy and you are on the way to recovery. The spirit guides heard our prayers and your spirit guided you through the surgery. Your optimism, bravery, love, comsideration, spirituality and humility during these last few weeks have left me in awe, filled me with love and believe it or not, a sense of calm. Perhaps you are one of my angels, AnneMarie!! A toast to you, my friend! To Life! To Living, loving, laughter, and friendship. Thank you for getting though the surgery. I love you!